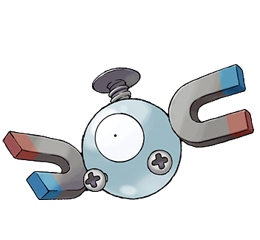 Magnet Pull Prevents Steel-type Pok�mon from escaping. Steel enemies cannot run or be switched out. floats in air on powerful electro� magnetic waves. approach trainers if they are using their POK�GEAR. Ruby/Sapphire MAGNEMITE floats in the air by emitting electromagnetic waves from the units at its sides. These waves block gravity. This POK�MON becomes incapable of flight if its internal electrical supply is depleted. Emerald The units at its sides are extremely powerful magnets. They generate enough magnetism to draw in iron objects from over 300 feet away. Leaf Green Uses antigravity to stay suspended. Appears without warning and uses THUNDER WAVE and similar moves. Diamond/Pearl The units at its sides generate electromagnetic waves that keep it airborne. It feeds on electricity. Platinum The faster the units at its sides rotate, the greater the magnetic force they generate. Heart Gold It is attracted by electromagnetic waves. It may approach Trainers if they are using their Pok�gear. Soul Silver The units at the sides of its body generate antigravity energy to keep it aloft in the air. Black The faster the units at its sides rotate, the greater the magnetic force they generate. White The faster the units at its sides rotate, the greater the magnetic force they generate.